A notable song on the soundtrack is "Colors of Love," written by Carole Bayer Sager, James Ingram and Bruce Roberts, and produced by David Foster, which alludes to the story line. Zora Matthews, whose mother Sarah conceived her with the aid of an anonymous sperm donor, discovers that her father is a white man named Hal Jackson. This comes as a major shock to Sarah, who had explicitly requested a black donor. On top of that, Jackson is a loud, self-promoting car salesman, which clashes with Sarah's intellectualism. The film revolves around Zora and her mother's rocky relationship with Jackson. Jackson eventually comes to love his daughter and her mother. The story did not originally specify black actors for any of the roles and was rewritten upon Goldberg's casting. The character of Hal Jackson is based in part on the real life car dealership owner Cal Worthington. Hal's use of large circus animals in his car commercials are an homage to Cal's famous "My Dog Spot" ads, which were also filmed with live circus animals. The soundtrack album was released on May 28, 1993. Sérgio Mendes – What Is This? The film opened in theaters on May 28, 1993, and grossed over $12 million on its opening weekend. It was released to over 2,000 theaters and grossed nearly $50 million in the U.S. alone. Worldwide, it earned over $100 million. This was television star and Grammy Award-winning rapper Will Smith's second supporting role in a movie and started his successful career as a major film actor. Made in America earned mostly negative reviews from critics, holding a 31% rating on Rotten Tomatoes based on 29 reviews. However, Roger Ebert praised Goldberg's acting in the film and said "This isn't a great movie, but it sure is a nice one." ^ Rita Kempley (May 28, 1993). "'Made in America'". Washington Post. Retrieved May 16, 2016. ^ Fox, David J. (June 1, 1993). "`Cliffhanger' grabs the largest opening for a non-sequel on any Memorial Day weekend. 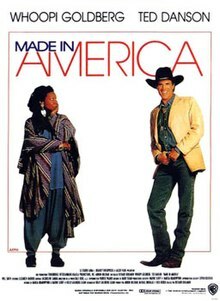 `Made in America' opens in second place". The Los Angeles Times. Retrieved 2010-10-27. ^ "Review/Film; A Man, a Woman And a Sperm Bank Yield a 90's Romance". The New York Times. Retrieved 2012-06-05. ^ "Made In America". Chicago Sun-Times. This page was last edited on 25 February 2019, at 15:36 (UTC).